Polish statesman and author; born in Poryck, government of Volhynia, Russia, Aug. 28, 1765; died in Dubno, Volhynia, Feb. 8, 1813. When Prince Adam Czartoryski was placed at the head of the educational district of Wilna, Czacki was appointed school inspector of Volhynia, Podolia, and the Ukraine. An opponent of the Jesuits, he combated their work in the field of pedagogy, and on one occasion raised by public subscription the sum of two millions of Polish florins to insure the existence of the gymnasiums in Vinnitza and Kiev. In 1805 he founded the high school in Kremenetz, Volhynia, which was destined to be of inestimable benefit to the Poles. Its influence is still evident in Volhynia, Podolia, and the Ukraine. After Czacki's death his heart was deposited in one of the halls of this Volhynian school, under the inscription "Ubi thesaurus tuus, ibi est cor tuum." It was Czacki that discovered the grave of Copernicus, proving most conclusively the Polish origin of that great astronomer. 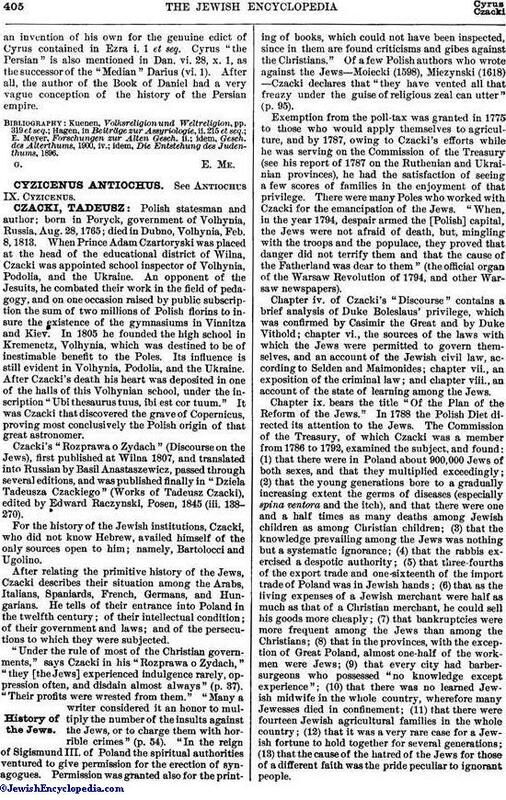 Czacki's "Rozprawa o Zydach" (Discourse on the Jews), first published at Wilna 1807, and translated into Russian by Basil Anastaszewicz, passed through several editions, and was published finally in "Dziela Tadeusza Czackiego" (Works of Tadeusz Czacki), edited by Edward Raczynski, Posen, 1845 (iii. 138-270). For the history of the Jewish institutions, Czacki, who did not know Hebrew, availed himself of the only sources open to him; namely, Bartolocci and Ugolino. After relating the primitive history of the Jews, Czacki describes their situation among the Arabs, Italians, Spaniards, French, Germans, and Hungarians. He tells of their entrance into Poland in the twelfth century; of their intellectual condition; of their government and laws; and of the persecutions to which they were subjected. "Under the rule of most of the Christian governments," says Czacki in his "Rozprawa o Zydach," "they [the Jews] experienced indulgence rarely, oppression often, and disdain almost always" (p. 37). "Their profits were wrested from them." "Many a writer considered it an honor to multiply the number of the insults against the Jews, or to charge them with horrible crimes" (p. 54). "In the reign of Sigismund III. of Poland the spiritual authorities ventured to give permission for the erection of synagogues. Permission was granted also for the printing of books, which could not have been inspected, since in them are found criticisms and gibes against the Christians." Of a few Polish authors who wrote against the Jews—Moiecki (1598), Miezynski (1618)—Czacki declares that "they have vented all that frenzy under the guise of religious zeal can utter" (p. 95). Exemption from the poll-tax was granted in 1775 to those who would apply themselves to agriculture, and by 1787, owing to Czacki's efforts while he was serving on the Commission of the Treasury (see his report of 1787 on the Ruthenian and Ukrainian provinces), he had the satisfaction of seeing a few scores of families in the enjoyment of that privilege. There were many Poles who worked with Czacki for the emancipation of the Jews. "When, in the year 1794, despair armed the [Polish] capital, the Jews were not afraid of death, but, mingling with the troops and the populace, they proved that danger did not terrify them and that the cause of the Fatherland was dear to them" (the official organ of the Warsaw Revolution of 1794, and other Warsaw newspapers). Chapter iv. of Czacki's "Discourse" contains a brief analysis of Duke Boleslaus' privilege, which was confirmed by Casimir the Great and by Duke Vithold; chapter vi., the sources of the laws with which the Jews were permitted to govern themselves, and an account of the Jewish civil law, according to Selden and Maimonides; chapter vii., an exposition of the criminal law; and chapter viii., an account of the state of learning among the Jews. Chapter ix. bears the title "Of the Plan of the Reform of the Jews." In 1788 the Polish Diet directed its attention to the Jews. The Commission of the Treasury, of which Czacki was a member from 1786 to 1792, examined the subject, and found: (1) that there were in Poland about 900,000 Jews of both sexes, and that they multiplied exceedingly; (2) that the young generations bore to a gradually increasing extent the germs of diseases (especially spina ventora and the itch), and that there were one and a half times as many deaths among Jewish children as among Christian children; (3) that the knowledge prevailing among the Jews was nothing but a systematic ignorance; (4) that the rabbis exercised a despotic authority; (5) that three-fourths of the export trade and one-sixteenth of the import trade of Poland was in Jewish hands; (6) that as the living expenses of a Jewish merchant were half as much as that of a Christian merchant, he could sell his goods more cheaply; (7) that bankruptcies were more frequent among the Jews than among the Christians; (8) that in the provinces, with the exception of Great Poland, almost one-half of the workmen were Jews; (9) that every city had barbersurgeons who possessed "no knowledge except experience"; (10) that there was no learned Jewish midwife in the whole country, wherefore many Jewesses died in confinement; (11) that there were fourteen Jewish agricultural families in the whole country; (12) that it was a very rare case for a Jewish fortune to hold together for several generations; (13) that the cause of the hatred of the Jews for those of a different faith was the pride peculiar to ignorant people. 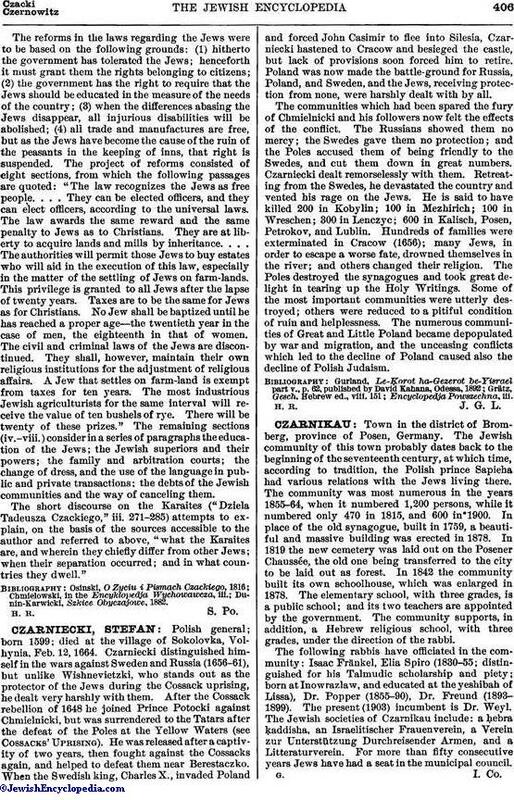 The reforms in the laws regarding the Jews were to be based on the following grounds: (1) hitherto the government has tolerated the Jews; henceforth it must grant them the rights belonging to citizens; (2) the government has the right to require that the Jews should be educated in the measure of the needs of the country; (3) when the differences abasing the Jews disappear, all injurious disabilities will be abolished; (4) all trade and manufactures are free, but as the Jews have become the cause of the ruin of the peasants in the keeping of inns, that right is suspended. The project of reforms consisted of eight sections, from which the following passages are quoted: "The law recognizes the Jews as free people. . . . They can be elected officers, and they can elect officers, according to the universal laws. The law awards the same reward and the same penalty to Jews as to Christians. They are at liberty to acquire lands and mills by inheritance. . . . The authorities will permit those Jews to buy estates who will aid in the execution of this law, especially in the matter of the settling of Jews on farm-lands. This privilege is granted to all Jews after the lapse of twenty years. Taxes are to be the same for Jews as for Christians. No Jew shall be baptized until he has reached a proper age—the twentieth year in the case of men, the eighteenth in that of women. The civil and criminal laws of the Jews are discontinued. They shall, however, maintain their own religious institutions for the adjustment of religious affairs. A Jew that settles on farm-land is exempt from taxes for ten years. The most industrious Jewish agriculturists for the same interval will receive the value of ten bushels of rye. There will be twenty of these prizes." The remaining sections (iv.-viii.) consider in a series of paragraphs the education of the Jews; the Jewish superiors and their powers; the family and arbitration courts; the change of dress, and the use of the language in public and private transactions; the debts of the Jewish communities and the way of canceling them. The short discourse on the Karaites ("Dziela Tadeusza Czackiego," iii. 271-285) attempts to explain, on the basis of the sources accessible to the author and referred to above, "what the Karaites are, and wherein they chiefly differ from other Jews; when their separation occurred; and in what countries they dwell."